#6ItemsChallenge || Week 2 - CounterCultural. CounterCouture. We’re almost at the end of week 3 but I wanted to share with you my outfits from the week before. It’s been an interesting week, between working in an office, traveling to Bristol for #BlogClub and dressing for the weekend. I may have worn my jeans and skirt two days in a row and my jumper three days. 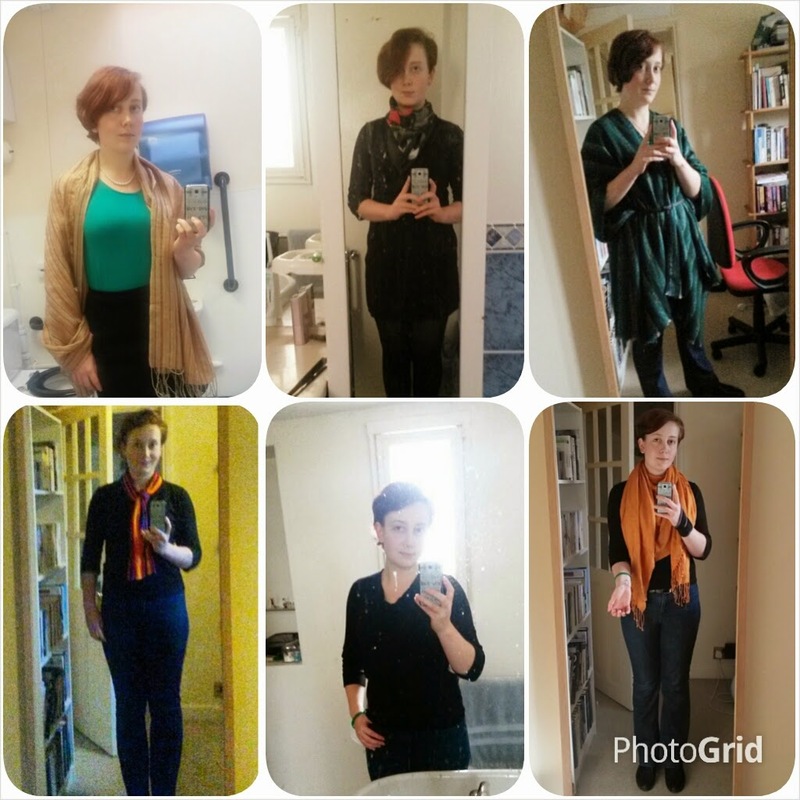 The key I have discovered is to ring the changes with my, possibly too big, collection of scarfs. from neckerchiefs worn ‘Western style’ to shawls. I even managed to wear my rainbow scarf I brought from Toybox years ago. I’m still not sure if it worked but it added a nice flash of colour. So what has been the most challenging part of the #6ItemsChallenge so far? Well, last Saturday I ended up wearing a damp jumper as I had no other clean clothes to wear on my top half. While I can double up a scarf as a skirt, I’m not so sure about the top that I rely on to protect my modesty. It really made me think about how those who make the clothes I wear. Do they have the choices I normally have? Can they simply pull out another top if their chosen one is dirty? I doubt it. Are the low prices I paid for my clothes worth it? I don’t think so. So all I am asking is for you to sponsor me £10. It doesn’t seem like much but, as Tesco love to point out, every little really does help. So click here and sponsor me a tenner. Who know what it could change.